A 30-year-old man was arrested on Sunday morning in South Brunswick and charged with September shooting death of Jibri Chisolm, Mercer County Prosecutor Angelo J. Onofri reported. 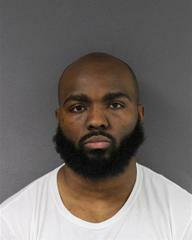 Stephan P. Green, of Bond Street, Trenton, is charged with first-degree murder, first-degree attempted murder, two counts of second-degree possession of a weapon for an unlawful purpose, second-degree unlawful possession of a weapon and second-degree certain persons not to possess a handgun. He is being held at the Mercer County Correction Center pending a detention hearing. The charges are a result of an investigation by the Mercer County Homicide Task Force (MCHTF). Warrants were issued for Green on September 22 . Green was arrested by South Brunswick Police, U.S. Marshals NY/NJ Regional Fugitive Task Force, and the Mercer County Homicide Task Force at the Sonesta Suites at 8:30am on Sunday. This September 23-29, 2018 is “Rail Safety Week” across the United States. The South Brunswick Police Department will be conducting directed enforcement of railway crossings during this specific week. Amtrack’s “Operation Clear Track” is designed to raise the public awareness about the dangers of failing to comply with railroad safety laws. The goal of this program is to prevent railroad related deaths and injuries within our community. On September 25, 2018, the South Brunswick Police Department will be enforcing our state’s grade crossing and trespassing laws at two locations within the city, Culver Road and Route 535 (in the area of the NJ Turnpike bridge). For more than 50 years, the South Brunswick Office of Emergency Management has been responsible for coordinating the activities of all municipal departments to protect South Brunswick community from natural and man-made disasters and emergencies. South Brunswick OEM routinely works with emergency responders, private industry, faith based groups, schools, and other community groups to prepare and respond to any emergency. 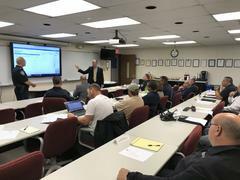 Today South Brunswick OEM Coordinator Chief Raymond Hayducka conducted his annual meeting to review past efforts and prepare for future work. Nearly two dozen stakeholders attended the meeting.